mControl, well known Windows-based home control system, recently announced supporting of CentraLite JetStream devices. 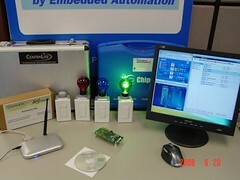 CentraLite JetStream uses Z-Wave competitor ZigBee. The system is fully expandable and can be integrated with other automation products such as thermostats, entertainment systems, and security equipment. Actually JetStream functionality was added some time ago. But wasn’t announced till devices weren’t started to sell on the market. To see mControl and JetStream in the action see that video presentation. mControl already support Insteon, Z-Wave, Rako, and X10. So, CentraLite JetStream will be good addition to that list. Nice and clear looking stand for media center designed by Reynold Rodriguez. 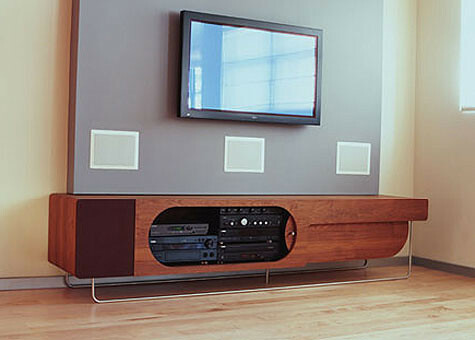 It isn’t so easy to find a good furniture to put there all parts of home theater including wall mounted plasma or LCD. By some reason system recognized DVB card as sound. To avoid that I just added snd_aw2 into /etc/modprobe.d/blacklist. Now my LinuxMCE works like a charm! LinuxTag, Europe’s leading exhibition on Linux and Open Source took place from May 28 – 31, 2008 at Berlin’s Messezentrum unter dem Funkturm. 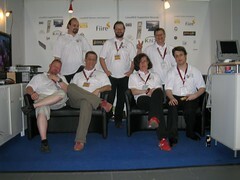 LinuxMCE community participated in that major event. KR, Zaerc, Hari, DanielK22, Posde, ddamron and TSCHAK showed mostly full range of devices supported by LinxuMCE: Z-Wave adapter and modules, IP phones and cameras, different kinds of Orbiters – Nokia Internet Tablet, JavaMO, Symbian MO and Windows XP, and remote controls. That exhibition installation can be used as a start for newbies who want to have home automation system with rich functionality and open code in their houses. That wiki page contains a bunch of nice shots which shows LinuxMCE in action. Also that PDF presentation might be interesting for all who’d like to know what is LinuxMCE and its basic functions (thanks to Daniel). My congratulations to LinuxMCE exhibition team, all developers and community (I’m also a part of LinxuMCE community :)). We’re making amazing product!